Friends, today we will discuss Vivo's dhoti phone. Friends Vivo Company's new smartphone Vivo V9 Pro will be launched in India on September 26. This phone is an upgrade version of Vivo V9 launched in March and this phone has been teaser by Amazon. After all, it is known in such a special way. 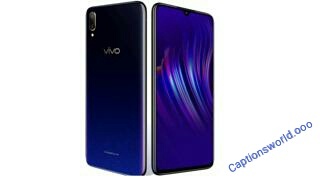 After launching Vivo V9 and V9 Youth in the Indian market, the company is now ready to launch its V9 Pro. Meanwhile, news from the e-commerce world is coming out that this smartphone is also going to be the Amazon Exclusive. Instead of announcing the official page on the official page, Live announced through a post on the Amazon page that Vivo is launching Vivo V9 Pro, the best smartphone on September 26. Vivo company's new smartphone Vivo V9 Pro will be launched in India on September 26. This phone is an upgrade version of Vivo V9 launched in March and this phone has been teaser by Amazon. Last week, some reports related to this phone were revealed, according to them, the price of this phone will be less than Rs 17,990, which is a matter of great happiness for the customers, let's know about the ease of this phone. According to Amazon's listing and last week's report, this smartphone will have a 6.3-inch full HD Plus display. With an aspect ratio of 19: 9. For processing, this phone will have a 2GHz octa-core Snapdragon 660 processor. This phone will have 6GB of RAM and 64GB internal storage. For photography, this phone will have a 13 + 2-megapixel rear camera and 12-megapixel camera at the front. This smartphone will be based on the Android 8.1 Orio and will be given 3,260mAh battery. Along with this, there will also be a fingerprint sensor in the rear. All the connectivity related features are included in this smartphone, which will include Dual Band WiFi 802.11, Bluetooth, GPS and Micro USB Type C and 3.5mm Audio Jack. Friends, how to do you like Vivo v9 Pro Mobile, and which of its features you liked, you must tell us by commenting and share this post with your friends so that your friends also know about this mobile About the same goes for Jai Hind Vande Mataram, in our next article. I think Vivo is overrated. There are many similar brands with very low price which provide similar quality devices!